Have you ever dreamt to walk on stilts? If you want to learn it, visit us every first and third Saturday of the month between 14:00 and 16:00 to find out the good feeling of walking on stilts. 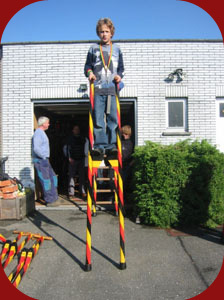 These trainings are monitored and assisted by our most experienced stiltwalkers. And when you built up enough experience, you can join us for performances in and outside Belgium! On these pictures you see some of our young members exercising. 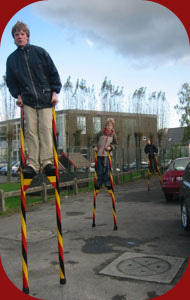 The more frequent you exercise, the quicker you are alowed to walk on higher stilts. After having built up experience, you can start walking on leg-attached stilts, so that your arms are free to use when your nose itches up there!